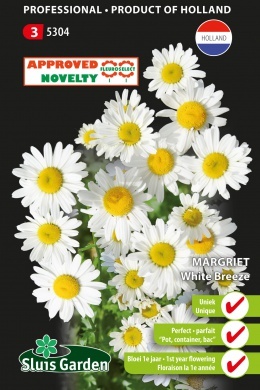 White Breeze has rightly received the “Fleuroselect Approved Novelty Award”, for its exceptional and improved qualities. White Breeze blooms in the fi rst year it is sown and produces very lovely approximately 4 cm large flowers with a yellow heart. This perennial is healthy and strong and with a height of approximately 25 cm is also perfectly suited for growing in pots and containers. Exuberant and long-term flowering in the following years is the great result.